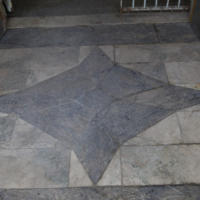 Photograph of the tiled floor in the entry to the Oak Ridge building taken prior to demolition in 2014. 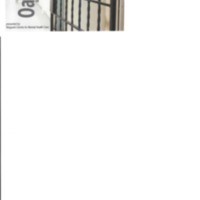 Series of three photographs of the plaque that commemorates the history of the Reformatory for Boys in Penetanguishene. 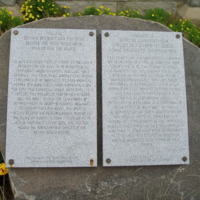 Plaque installed in 2004, photograph taken in 2005. Postcard announcements for both the original pre-screening and official launch of the Oak Ridge: A History in Care documentary. 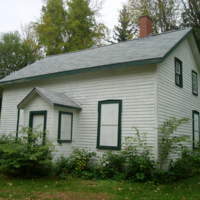 Photograph of white cottage in which staff lived on the hospital grounds taken in 2005. 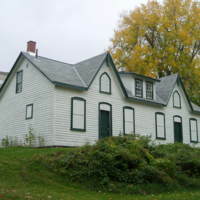 Series of two photographs of the white cottages that staff once lived in on the grounds of the Mental Health Centre taken in 2005. 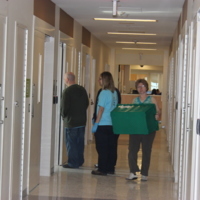 Photograph of patients and staff arriving on a ward of the Atrium building after transfer from the Oak Ridge building on May 5, 2015. 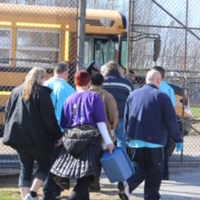 Photograph of patients and staff boarding a bus to move from the Oak Ridge building to the Atrium building on May 5, 2015. 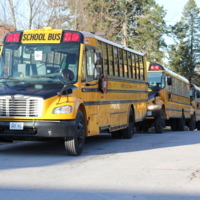 Photograph of yellow school buses lined up to transfer patients from the Oak Ridge building to the Atrium building on May 5, 2015. 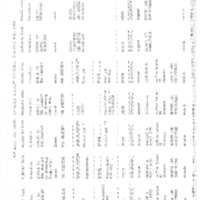 First five pages of a Classroom Report from the "New Building" (Criminal Insane Building) submitted by teacher Leonard O'Leary to the Superintendent. 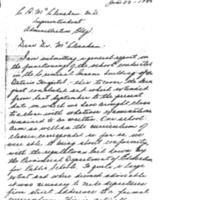 Document dated June 23, 1937. Includes descriptions of classroom attendance, students in general.